Maxine Esteban is not your ordinary Filipina teenager. 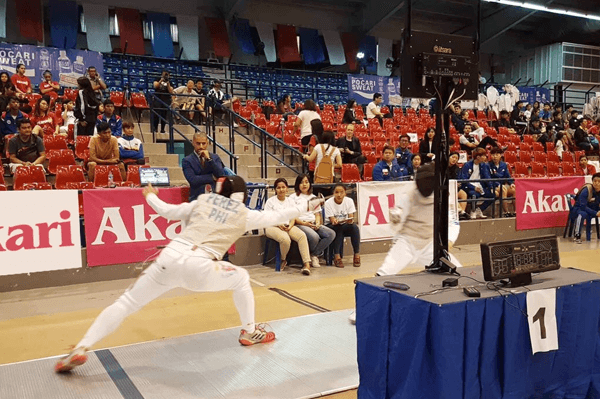 She’s a national fencer who not just represents the country in international competitions, but also does her part in helping fellow Philippine athletes who are not fortunate enough to afford training and equipment. Esteban is also a violinist, something she does to improve her concentration, practice, accuracy and speed. And as the 2018 Akari-Asian U23 Fencing Championships begin tomorrow at the Ynares Sports Arena, Esteban has one mission: to win a medal in the individual event. “I believe that never has any Filipino won any medal in the Asian Championships so I would like to be the first,” she told Akari Sports. The daughter of former athletes who have been very supportive throughout her career, Esteban’s journey has not been all rosy. In the leadup to the 2015 Southeast Asian Games, Esteban suffered an injury that left her on the shelf for a year. But while it was hard and painful, Esteban worked hard, never gave up, and along the way, picked up a ton of lessons that made her as strong as she is today. The same patience and determination are what Esteban needs now more than ever, as she chases a chance to don the national colors in the 2020 Olympics in Tokyo, Japan. She admits she’s far from that dream, as no Filipino fencer has even won a medal in the Asian Games since 1974. That doesn’t mean, however, she’s pulling back. But whether she makes it to Tokyo — or even to Paris in 2024 — or not, Esteban is already a winner in her own right. A couple of years ago, she started TOUCHE — Together U Can Help Educate — a project she does to help fellow fencers get gear and education so they will eventually land a scholarship. Esteban also wants to push the Philippines’ reputation in international fencing tilts. “My family has supported me in this endeavor thru international competition, camps, training and coaches and because I have made quite a good achievement in the last few years, I have elevated the ‘impression’ of other countries about Philippine fencing/Philippine athletes,” she said. “Filipinos are very talented. However, due to lack of funding and resources, we are unable to acquire the needed skill to become world class,” she added. So when the tournament begins Tuesday, Esteban is raring to not just show her fencing skills for the whole of Asia to see.